Instagram is an incredibly valuable tool for any business or influencer. And as of Summer 2018, the platform celebrated 1 billion monthly active users. To put that into perspective, you’re looking at about an eighth of the planet’s total population. It’s no surprise then, that people are turning to using an Instagram bot to get more Instagram followers. More users on Instagram means more competing businesses to outshine, and more clutter to get through. Before we move any further, let’s look at what our top picks are if you’re looking for Instagram automation. Then, we’ll explore what an Instagram bot is and the types you’ll find across the web (there are loads)! KENJI.AI is probably one of the newest bots we’ve come across and we actually loved using it. Like any Instagram bot, it automates your activity. But surprisingly, KENJI does it incredibly efficiently. Why’s that you ask? 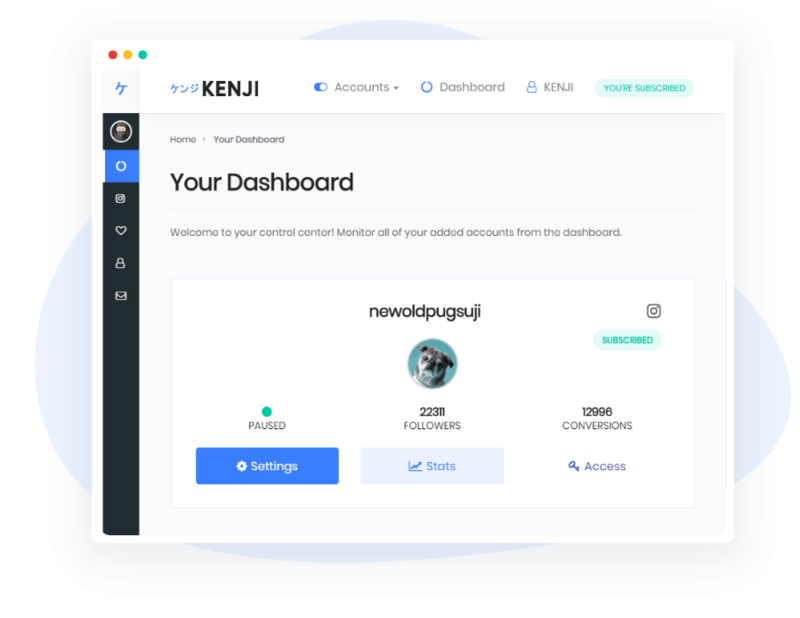 KENJI uses machine learning algorithms to determine who’s most likely to engage with your account. It sounds complex, and it probably is – but they’ve made the sign up and set up experience so simple for the end-user (you, maybe)! We were set up within a minute or two and our account began its automation, which is really cool, as other tools are really fiddly and have login problems. Most importantly for users like you and I, this particular Instagram automation tool doesn’t get you fake followers. I spoke to someone named ‘Ryu’ through their support channel and they mentioned that they specifically filter out fake looking accounts before even engaging with them on your behalf. That’s awesome, because it meant the 30+ followers we were getting per day were actually real people. Overall, our account grew by about 900 real, organic followers over a 2 month period. While these results aren’t abnormal, we don’t think it’s representative of every Instagrammer who chooses to use KENJI or any other automation tool for that matter. Of course, you’ll need to put out great content that’s actually worth following for. In any case, they offer a 3-day free trial without any credit card requirements. 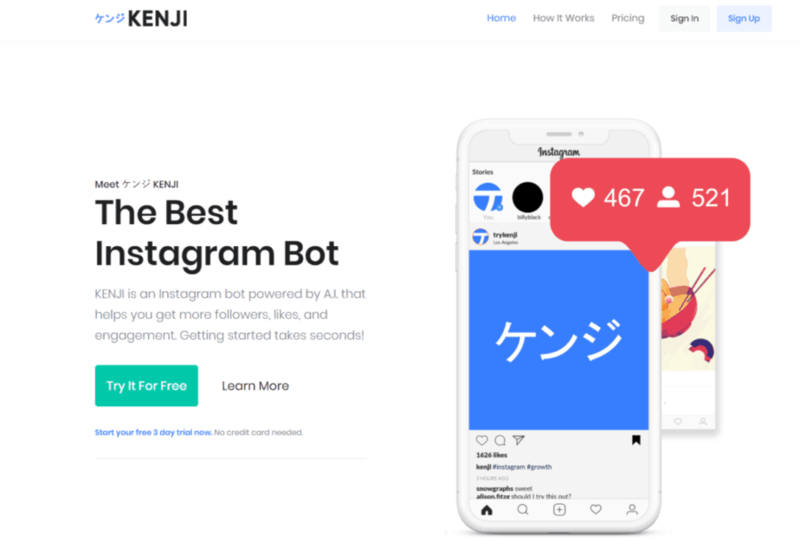 If you’ve only landed on our page for recommendations… well, KENJIis probably the bot you’d like to stick with. So Hold On, What is an Instagram Bot? Instagram bots are a way of delegating your repetitive, mundane social media tasks to an intelligent application. At home, if you couldn’t be bothered to wash your dishes, you’d buy a dishwasher to do it for you. In social media, if liking and commenting on posts bore you to tears, you buy an Instagram bot. Or at least – that’s the idea. Instagram bots are designed to automate your account interactions. They can do everything from liking the comments that your customers leave on your posts, to posting comments on another person’s content. Since liking and following other people generally leads to them liking and following you in return, it’s a great way to get something that looks like engagement. Unfortunately, not all that glitters is gold in the world of the Instagram bot. For years, companies have been using Instagram bot accounts to earn thousands of followers in a short amount of time. The only trouble is that these followers rarely have much value to offer the business long-term. As artificial intelligence becomes more advanced, your Instagram bot can do a number of things. Typically, bots make great “fake” followers because they follow vast numbers of accounts at once. In 2017, Imperva (a data security company) found that bots made up about 51.8% of all online traffic in 2016. Most companies categorize Instagram bots according to the actions that they perform. Automatically follows people: The idea is that if you follow someone relevant in your industry, they’ll follow you in return. This can cause their friends to support you, and so on, prompting a massive gain in visibility. Likes & Comments on external posts: Comment on posts from influencers and thought-leaders in your industry opens the door for collaborative partnerships. It also makes your business appear more active online that it is. Likes & Comments on your posts: When people are deciding whether to comment on your Instagram posts, they can often be swayed by whether someone else has done so first. Crowd mentality means that content with comments is more likely to attract more engagement. There are also slightly safer versions of the Instagram bot that simply allow you to queue your posts up in advance and post them automatically. These bots aren’t designed to grow your Instagram following or generate more likes. Instead, they’re there to make sure that you maintain a consistent presence on Instagram. Since 70% of users say that they look up organizations on their #IG accounts, it makes sense to have a strong presence. The average “growth” bot – the ones dealing in likes and comments works in one of two ways. Either it can like and comment on other users in the hope of reciprocity, or it can create multiple sub-bots to fill up your follower count. There are many different examples of Instagram bots on the market today. Why Do People Use Instagram Bots? Over 200 million visitors view a business account on Instagram every day. For your company, that means endless opportunities to generate new leads and sales – if you can find the time to interact with everyone who shows some interest. Unfortunately, most smaller companies don’t have a dedicated social media team that can drive engagement for them. What’s more, when you’re busy running your business, you probably don’t have hours to spend on your Instagram strategy each day. You’re out there finding sale opportunities and looking for investments. The chances are the liking, and commenting pictures isn’t at the top of your to-do list. An Instagram bot means that you can trust someone or rather “something” else to do the work for you. Reports in 2018 suggested that Instagram may have around 95 million bot accounts attached to it. That’s almost 10% of the entire userbase. So much evidence of bots must mean that these solutions are pretty popular, right? Instagram bots like, comment, follow and engage with your audience, so you don’t have to. While they’re dealing with all the repetitive stuff, you get to spend more time focusing on things. Like creating amazing content and running your business! People use bots to make their life easier. It’s the same as us creating washing machines because we don’t want to clean our clothes by hand. What’s more, unlike humans, bots don’t have to sleep or set aside time for their social lives. They’re not going to complain that they’re not getting enough work/life balance if you ask them to work through the night. Bots are there to execute code consistently. Whether that means leaving emoji-infused comments on every post in your industry or liking endless posts is up to you. If you’re limited in time and you want to boost your number of followers fast, bots can seem like the best option. They give you a way to get your foot in the door with other Instagrammers. What’s more, they make it much easier to maintain a consistent activity level. However, there’s always a flip side to be aware of too. It’s hard to argue that Instagram bots don’t have their uses – no matter what your stance might be. An Instagram bot can save you time and simplify your social media strategy. It can also give you more control over your online presence. However, they’re not always as beneficial as they’re cracked up to be. Automation-based marketing has its dangers, and it’s important to know what you’re getting yourself into. Excellent time-saving opportunities. You can always make more money in the business world, but finding enough time is harder than most people realize. Instagram strategies are fantastic, but they also take a lot of time and effort to perfect. You have to engage with your followers, answer all of their questions, and comment on their posts. An Instagram bot can take care of those things for you. Consistent content: Read any article on branding, and you’ll learn that consistency is key to success. The more consistent you are, the more familiar your brand feels to your audience. Automating your posts with Instagram bots ensures that you can deliver content more frequently. You can even time your posts so that they’re always fresh when your audience is logging on. Lets you focus elsewhere: An Instabot frees up a lot of focus for other things. Bots come in handy when you need something to interact with your users 24/7. After all, you can do everything on your own. At first glance, the positive side of using an Instagram bot is enough to tempt any business owner. However, there’s a downside to automation too. Using Instagram bots is a little bit like eating an entire packet of cookies. You enjoy it at the time, but you eventually realize that it’s not good for you – usually after the damage is done. Remember that being caught violating Instagram’s terms of service can spell the end for your Instagram account. Lately, the IG team have been cracking down extra hard on people who use bots to generate fake likes and engagement. If you’re caught out, then you risk being shadowbanned or permanently suspended. At the same time – we’ve never been banned for automating our accounts as a test. It all depends on whether you’re using the best Instagram tools or not. In late 2018, Instagram began making more of a profound effort to fight back against Instagram bots and automated applications. According to official statements from the social media company, accounts found using those service would receive an “in-app” message that would let them know their inauthentic likes and followers were being removed. In other words, even if you don’t get banned from Instagram immediately for using a bot, all your hard work (and money) will add up to nothing if you choose the wrong automation tools. The purpose behind the #FakeFollower purge isn’t just to prevent people from getting easy access to extra likes and followers. Instagram also hopes that by blocking apps, they can stop certain kinds of abuse. Instagram is probably more vulnerable to issues with bots than most social media channels, because of its emphasis on imagery. It’s difficult to scan pictures to find words that contain misinformation and hate speech. What’s more, images and videos are far better positioned to go viral than text. Instagram’s issues with curtailing offensive material on the app is why the channel has become so focused on eliminating the Instagram bot. In 2017, the third-party service “Instagress” was shut down after Instagram discovered it was an auto-liking app. Amid growing demand for privacy after the Cambridge Analytica data-sharing scandal, Instagram is under more pressure than ever before to show their customers that their accounts are safe. Ultimately, Instagram can’t afford to take risks with bot access anymore. Perhaps you’re 100% against the era of the Instagram bot, and you’re eager to avoid working with any brand or influencer who automates their posts. If that’s the case, then you’ll need to learn how to track people using Instagram bots. Although, as we mentioned above, using an Instagram bot isn’t 100% legal, that hasn’t stopped people from searching for workarounds. After all, managing an Instagram campaign is hard work, and a bot can do a lot to simplify things. It’s not just Instagram that suffers from the scourge of bots either. According to researchers, Twitter is home to about 30 million bot accounts. There are also plenty of automated followers on Facebook too. The good news is that there are ways you can increase your chances of successfully tracking an Instagram bot. These methods won’t work 100% of the time, but they will make it easier to determine who you want to work with if you’re planning on using Instagram influencer marketing or partnering with other brands. You can track down what the Instagram profile you’re looking at has been doing lately and find out whether their activity seems legitimate. If they constantly only like and comment on a handful of specific accounts, and never publish their own content, that’s a good sign that you’re dealing with a bot. If you don’t have time to search through every potential bot account yourself, then you can always seek help from an automated bot checking program. Plenty of tools online today can tell you whether a @Username has been reported as a bot. If you successfully discover a bot account, then it’s up to you to decide what you want to do next. Instagram has a system that you can use to report “abuse.” Because bot usage is not permitted by the app, you can report any account that’s automating their content. The Secure Side of the Instagram Bot: What’s Safe to Automate? Discussions about Instagram bots don’t have to be all doom and gloom. There are ways to automate parts of your Instagram strategy without putting your business at risk. Depending on the age of your account, and how credible you are, you might even be able to automate Follow/Unfollow actions without getting into trouble. Perhaps the safest method of automation available for an Instagram account is automating your post calendar. If you want to be successful on Instagram these days, you can’t just post great content – you need to publish the right material at best possible time. Some scheduling applications that have been approved by Instagram allow you to do this – although it’s important to do your research in advance. You can also safely set up push-notifications to your smartphone that remind you of when you need to post to get the highest levels of engagement. Anything that helps you to plan and schedule your Instagram feed is usually safer than the tools that mimic engagement on your behalf. Tools like Buffer, CoSchedule and so on are still relatively safe to use. However, it will depend on the nature of your Instagram account. You might even be able to set up bots that automatically respond to direct messages sent to your Instagram account from customers. You might have seen companies doing something similar to this on Facebook, as it’s an excellent way to let people know that you’ll get back to them as soon as possible. Ultimately, the tools that aren’t safe are the ones that use the Instagram API without its permission. For instance, the famous Instagress automatic liking and commenting tool were shut down at Instagram’s request in the Spring of 2017. MassPlanner was also shut down on the 12th of May that year. These tools that like and comment on posts automatically often lead to more problems than solutions. However, if you were to follow the strategies of an Instagram bot manually, then you’d probably have a pretty good promotional plan. For instance, the average Instagram bot allows people to track down customers based on hyper-targeted hashtags and other information. Doing this manually is a great way to track down members of your audience that aren’t necessarily following you yet. With a little bit of creativity, you can type up a message or comment that will show the valuable side of your business and convince people to come and join your tribe. The manual approach means that you don’t violate Instagram’s terms of service – but let’s face it; it’s a lot slower. So, if signing up to use an Instagram bot is too risky, how do you simplify your Instagram strategy and achieve your goals without spending endless hours on your smartphone? The most obvious alternative to using an Instagram bot is deciding to do everything yourself. This is easily the best way to make sure that you’re building the most personal, authentic relationships with the people you want to connect with over Instagram. You can make sure that you’re tracking down the right people to grow your community and engage with them in meaningful ways through in-depth comments, videos and more. You can even take your personalized messages to the next level by clicking through into each user’s profile and learning about them before you respond to a message. Of course, the biggest problem with this method is how slow it is. Sending even 50 well-thought-out messages each day could take hours. Then you have to account for all the time spent tracking down new audiences and liking their posts. It’s exhausting. If you’ve got a business to run, then the chances are that you won’t have time to handle everything manually, unless you have a dedicated social media team. If you don’t have the time, or the employees to focus on building an engaging and compelling Instagram profile fast, then you’ll need to take things a little slower. Sometimes, merely spending twenty minutes each day replying to a few comments and liking a couple of posts from your followers is enough to start the seeds of your Instagram presence growing. Of course, it’s going to take you a lot longer to see phenomenal growth this way, but you’ll get to where you need to be eventually. Sometimes, speed isn’t everything – mainly when you’re working on something as valuable and sustainable as an Instagram presence. Waiting a little longer for your Instagram campaigns to take off might be better in the long-term than spending a fortune on an Instagram bot, just have your account shut down for rule violations. Finally, if you can’t find enough time to do everything yourself, but you don’t want to compromise on the speed with which your presence grows either, then you can always get some help from a professional. Delegating repetitive Instagram tasks like liking, sharing posts, and responding comments don’t have to mean handing them to a robot. You can also try an authentic human service too, like Upleap. You can read about our Upleap review here. Basically they grow your Instagram organically with a dedicated account manager. Surprisingly it’s super affordable too, especially since we reached out to them and got you a discount code! Using these services will give you access to an affordable account manager who can work on developing your Instagram account for you. They work to get you more likes, comments, and engagement on your account, without using dangerous tactics. What’s more, it’s a lot more affordable than hiring an in-house social media expert to handle your profiles for you. 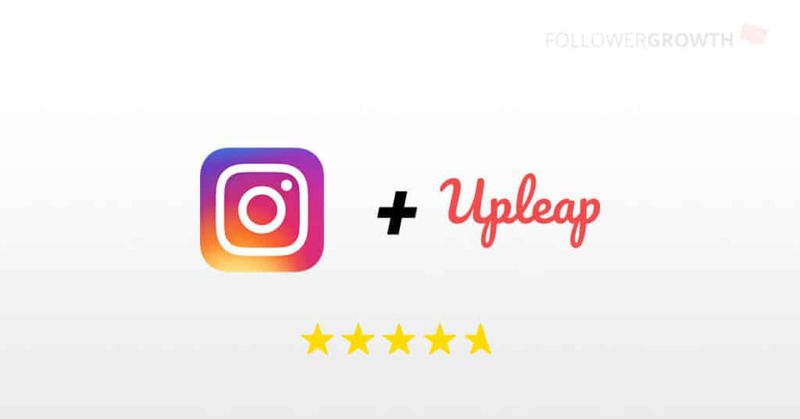 With help from experts like Upleap, you can get rid of much of the stress associated with your Instagram campaigns, and focus on running your business instead. Should You Be Using an Instagram Bot? Ultimately, we’re not here to tell you what you should or shouldn’t do with your business. From a professional and legal perspective, investing in Instagram bots is not always a good idea. Still, it’s impossible to argue with the benefits that the right Instagram bot can provide. When you’re struggling to keep up with the demands of a complex social media strategy, an Instagram bot can speed up your path to success. Additionally, if you use them sparingly for simple tasks like scheduling your posts, and responding to direct messages from customers, the result can be a more consistent brand image, and happier followers too. When it comes down to it, choosing whether or not to use an Instagram bot will depend on a number of different things, including the type of bot you’re interested in, and how you plan to use it. Even some of the world’s biggest companies like Google are relying on artificial intelligence and automated processes today to help them serve their customers. However, for the most part, it seems that bots aren’t intended to perform the tasks of a fully-functioning social media team. When it comes to things like making genuine connections with your audience and engaging in meaningful conversations, it’s difficult to hand the reigns over to a bot. Ultimately, these tools are still pretty basic in what they can accomplish. 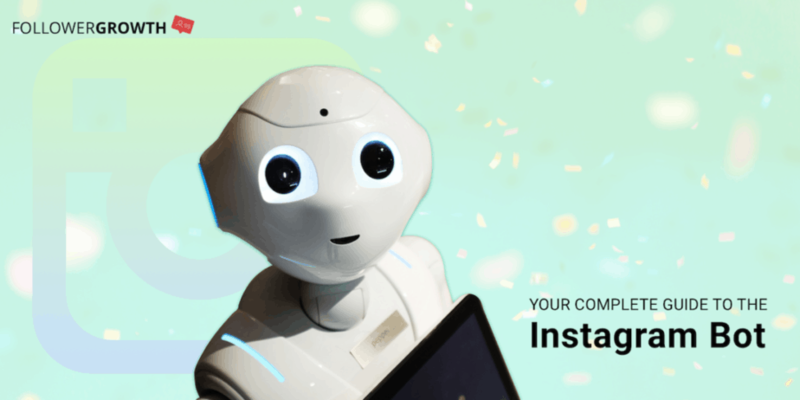 The chances are that you won’t be able to connect with people using an automated series of specific responses unless you use the right Instagram tool. Of course, check out our earlier recommendation about KENJI. We seriously vouch for few Instagram bots, but KENJIreigned supreme in all aspects of social media automation. Our advice? Consider bots for the simpler things that you’d rather automate in your Instagram strategy, like scheduling your posts, or reminding you when you need to engage with followers online. For the stuff that requires soul, either find the time to commit to your Instagram account yourself or find someone who can do it for you. Tech might be capable of a lot of things today, but it’s not quite ready to replace the authenticity of real human connections. At least, not yet. What are your thoughts on Instagram bots? Do you need help making the most of your Instagram strategy? Speak to us in the comments below or reach out to our team today! To round this all off, don’t forget to check out our post about our favorite Instagram tools of 2019! Macy has been growing Instagram accounts for influencers since 2013. As an Instagram veteran, she provides actionable tips to our Followergrowth readers!